Graham Biscuit 2 1/4 graham flour 1 cup wheat flour 1 tablespoon water 1 teaspoon soda 2 " cream tartar (or 3 of baking powder Small teaspoon salt Sift last 3 ingredients with wheat flour. 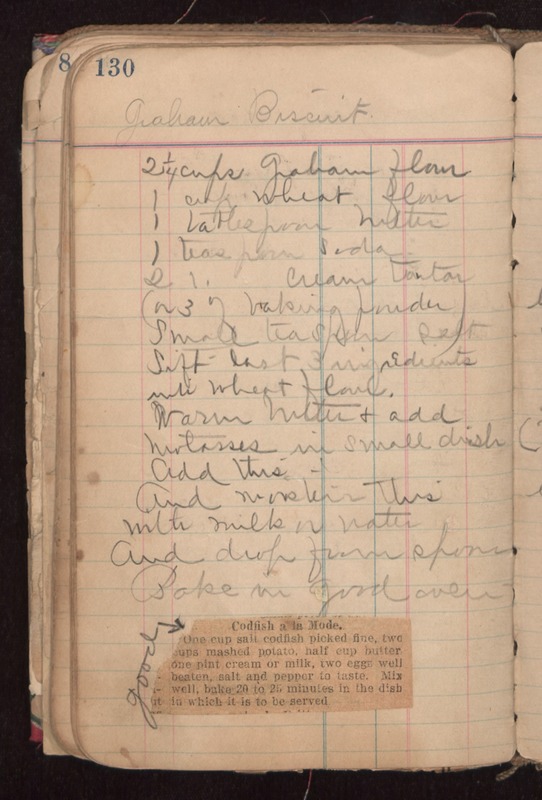 Warm butter & add molasses in small dish Add this and [illegible] this with milk in water And drop from spoon. Bake in good oven. good Codfish a la Mode. One cup salt codfish picked fine, two cups mashed potato, half cup butter, one pint cream or milk, two eggs well beaten, salt and pepper to taste. Mix well, bake 20 to 25 minutes in the dish in which it is to be served.